"'Sunset after Storm' (C. G. King, London - Bronze Medal). A very bold effect of light and shade, and a clever example of combination printing. Here, too. we have a different effect in the reproduction to that found in the original. 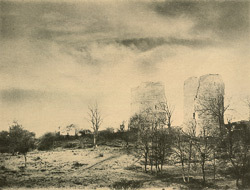 Mr. King informs us that he used the back combination of his rapid retilinear stopped down to f/22, the exposure being made on a Thomas' thickly-coated landscape plate, the weather at the time being dull and stormy. He has fully realised in the print the atmospheric conditions prevailing at the time when the negative was taken, for a more weird-looking photograph we do not ever remember having seen."